Guillermo Del Toro’s monster-mash original had its fair share of positive moments, largely drowned out in a bunch of uninteresting sub-plots, cardboard characters, and action scenes without stakes. The sequel is meant to be a little leaner, a chance for a younger generation of Jaeger fighters to do their work and practice team-building, but mostly allow the film-makers to thrust as much action at us as physically tolerable. If the first one was a middle-of-the-road Kaiju monster movie that doesn’t quite reach Toho heights, this one is the Transformers-esque knock-off. If you want big monsters fighting big robots, you’ll likely be somewhat pacified. If you want something a little more in your action films, this may come off more like unnecessary pre-summer fodder. The story follows a rag-tag group of new generation fighters against the re-arisen threat of Kaiju catastrophe. You’ll learn a little bit about the difficult places they come from, and Boyega and Tian give fine performances. However, by the end, this isn’t anything you haven’t already seen, and I completely never got into the smash-it-all action scenes. The importance of movies like this is about enjoying the spectacle. This lacked spectacle. Once in a while, you’ll find a diamond in the rough with these sappy, overdrawn romance films. You’ll get one that’s worth a laugh and is mildly touching, while still never getting too sentimental to stand. Melodrama can be a problem in the wrong context. With Midnight Sun, the performances are bad, which is to be expected, but it’s the complete lack of a true story and tasteless handling of a real-life condition that takes this movie’s potential to be something fun and twists into a dire journey about love and loss. The problem is that the movie, helmed by relatively inexpensive and inexperienced hands, cannot decide whether it wants to go fully into Nicholas Sparks pomp or try to say something greater. It never reaches any level of drama to say anything greater, but those attempts leave it grasping at straws when attempting to get to the fun-but-still-bad gooey center of a Sparks movie. Bella Thorne of ABC Family fame plays singer-songwriter Katie, who has ‘XP’ a true-life condition that makes her skin uber-sensitive to sunlight. She cannot go outside during the day, but begins living as a night prowler when she meets sensitive boy-next-door Charlie (Patrick Schwarzenegger, son of Arnold). But, things turn bad when she begins ignoring her condition. A ton of the criticism of this movie is launched at insensitive portrayals of a real-life condition that affects people everyday. I agree with that. However, if you need any more proof that this may not be the movie for you, I’d direct you to the scene about thirty minutes into the movie where Katie begins singing and playing guitar on a street corner. Not only is it clear lip-syncing, but the film-makers didn’t even care enough to make it look like she was actually playing her guitar. Her fingers move out of time, and the song is clearly strummed with a guitar pick while she stabs at the E-string with her bare thumb. If they don’t care, you shouldn’t either. Put this in the collection of movies I only watched because it features a “Game of Thrones” actor in an outside role. I recently reviewed Josie with Sophie Turner, and commented on how unfocused and unproductive that narrative feature was. 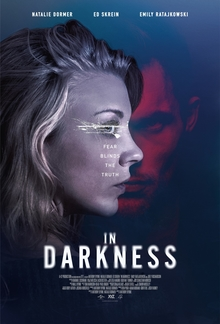 I’m happy to report that there’s a little more to Natalie Dormer’s In Darkness, a movie she co-wrote and co-produced with her fiance, Anthony Byrne. It’s not a perfectly executed movie, but it’s one that consistently kept my attention and curiosity. Dormer plays Sofia, a blind pianist who lives alone, and who clearly has a violent past. Her life changes quite significantly when her neighbor (Emily Ratajkowski), with whom she was friendly, strangely perishes in a fall from her top-floor apartment. Soon, she is thrown into the world of geo-political turmoil when she realizes her old neighbor had more definitive international connections than she had ever supposed. Dormer’s performance actually carries this movie as we see her traverse life and deal with her disability. It’s a committed performance that’s awarded with small moments like feeling the contents of drawers and tables and watching the surprise on Dormer’s face. She is truly great in this lead role, and although the plot about the international geo-political climate she gets into often feels muddy and unsatisfying, the film clearly benefits from a sturdy performance at the forefront. You won’t walk away being interested in the story, but the lead performance is magnetic enough to stick around until the conclusion.